Was there ever life on the red planet? That is one of the major scientific questions of our time, and the European Space Agency is searching for an answer with its ExoMars mission scheduled to take off from Baikonur in Kazakstan in mid-March. The estimated time of arrival, after a seven-month journey, is in October. 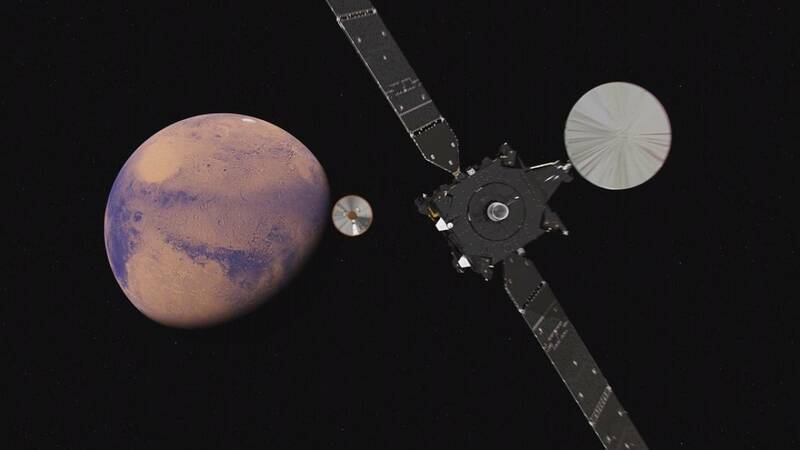 The Schiaparelli module – named after the 19th century Italian astronomer – will land on the Martian surface as the Trace Gas Orbiter goes into orbit to study the planet’s atmosphere. “Since it will be the first mission landing during the global dust storm season, we will conduct measurements during the descent that will allow us to determine important parameters of the atmosphere at this time of the year that has not been studied so much,” explains ExoMars project scientist Jorge Vago. The main objectives of the mission are to search for evidence of methane and other trace atmospheric gases that could be signatures of active biological or geological processes. According to Nicolas Thomas, Principal investigator of CaSSIS (the Colour and Stereo Surface Imaging System), “We are going and looking in great detail at the gas complements inside the atmosphere, and also looking for the potential of locally generated gases, which might be indicative of, for example, near-surface volcanic activity. It could even be connected to the release or sublimation of water, releasing gases that are trapped and, of course, we can talk a little bit about life, as a biological element to it… although I freely admit I’m a sceptic,” he adds. The ExoMars programme will also test a number of essential flight and on-site technologies necessary for future exploration missions. These will include the entry, descent and landing of a payload on the surface of Mars, surface mobility with a rover and sample acquisition, preparation, distribution and analysis. The ExoMars Programme consists of two missions. The next one, scheduled to be launched in 2018, includes a rover that will carry a two-metre drill and instruments dedicated to exobiology and geochemistry research. The rover’s mission will be to search for possible fossils, digging much deeper into the Martian surface than has ever been done before.